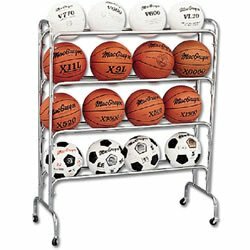 The whole basketball team can begin warming up and practicing their shooting, passing and dribbling skills when this Wide-Body Ball Cart is rolled onto the court. When placed on the sidelines, the wide, no-topple base ensures wild throws and shots won't knock the cart over and spill balls onto the hardwood. The cart can be wheeled right from the equipment room to the court thanks to hard rubber casters, which make this cart quick and easy to maneuver without leaving marks or scratches on the gym floor.